Mitchell 1 is committed to helping your business reach the next level with the industry’s most complete line of information software tools – including Real Fixes – for your professional auto repair shop. With Mitchell 1 at your side, you’ll fix cars faster, streamline shop workflow, and launch effective marketing strategies to build your business. 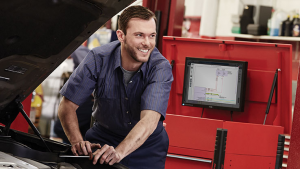 Our automotive software and services are designed to make every aspect of running your repair shop not just easier, but more efficient and profitable. From the very beginning of our 99 year history, Mitchell 1 has been providing information to help people repair vehicles. Our family of repair information software has grown to include solutions for cars and light, medium and heavy trucks. ProDemand® is our automotive repair solution that delivers access to complete OEM information and millions of “Real Fixes” based on actual repairs from professional auto repair shops. So you can be confident that you can handle whatever problem pulls into your driveway. Hear the clunking noise in that car that just showed up? It’s the sound of opportunity. We created a user-friendly navigation bar that makes searching for information easy and intuitive. Want to know what are the most commonly replaced parts for the car in your bay? With ProDemand’s advanced 1Search features, that information is already waiting for you when you select a vehicle to research. We’ve even made ProDemand mobile-friendly, so you can retrieve the repair information you need right at the vehicle. For commercial trucks, the TruckSeries suite of truck repair shop software puts complete service information just a few clicks away. With this software, you’re really that close to all the information you need to diagnose, estimate and repair Class 4 -8 trucks efficiently and profitably. We know that keeping track of all the moving parts in your auto repair shop can be a challenge. This is why we created our Manager™ SE shop management system. The “SE” doesn’t stand for “super-efficient,” but it might as well because that’s what it will help you become. Through this program, you can track every aspect of your shop’s operation. How many cars have come in this month compared to the last? How much profit did you make fixing what car and what problem? How accurate were the estimates compared to the final cost? How’s your inventory of parts? Are the technicians working productively? Information is power, and Manager SE gives you the ability to know what is working and what needs improvement. With 180 integrated reports, you can dive into your performance across all areas so you can make important business decisions based on reliable information. And for shops that service Class 4-8 trucks, there is Manager™ SE Truck Edition — providing all the tools in our industry-leading automotive shop management system, along with special features for the commercial trucking segment. Ever wished you had more customers? The key is connecting with customers — your existing customers and prospective customers — to bring them into your shop. Mitchell 1’s SocialCRM auto repair marketing service is a unique customer retention and new customer acquisition solution that automates your marketing, reputation management, social media and customer communication efforts. You can reach your entire customer database with targeted email marketing campaigns, automated thank-you messages and service reminders and more. And at the same time, SocialCRM shares verified reviews from your customers and increases your shop’s Internet visibility to help you attract new business. 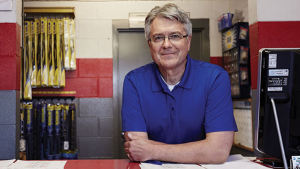 Engaging with customers is crucial to building relationships and a loyal customer base that will spread the word about their positive auto repair experience at your shop. The “social” part of the SocialCRM amplifies that word of mouth through social media and search-engine-friendly review content to be sure that customers find you first when they search for auto repair services. The SocialCRM service integrates with the Manager™ SE shop management system to give you automotive CRM tools at the point of sale. You can quickly recognized and engage with your most valuable customers when it really counts. You can be they will be impressed then you not only remember their name, but also thank them for their positive review. Step up efficiency with the most complete motor vehicle repair information solutions in the industry, covering both the automotive and commercial vehicle (Class 4-8) market segments. Track and manage every aspect of your auto repair business, from estimate to the final invoice, to increase car count, revenue per repair order, and profitability. Grow your auto repair business automatically with marketing services delivered and managed by your personal SocialCRM marketing expert dedicated to ensuring your campaigns are on target to deliver the best possible results.